Really, this is just a hardcover bound version of Marvel Age – Spider-Man Team-Up Issue Three. Which in turn is based on the Marvel Team-Up Issue 135, hence the inspiration credit. That issue was reprinted in Marvel Tales 245, though both are super affordable. So I ordered this book for my son, Walker Dennis. I thought it being close to twenty five dollars, that it would be made out of softer material – like a children’s book. Instead it was a hardcover and direct copy of the comic I already own, minus the ads. I had ordered it, so it was mine. If he destroys it, at least we were able to read it to him as a bedtime story. 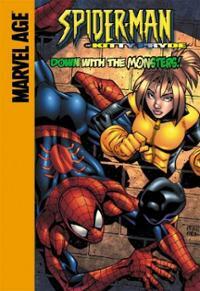 The book opens up with Peter Parker being bullied by Flash – a typical high school day for poor Peter. I like the lesson from the narration caption – sometimes being a good guy means having to tolerate people. He dons his Spider-Man costume. A young girl steals another gal’s groceries and runs off. Spider-Man gives chase, and everyone around thinks he is chasing her for her groceries. She mumbles to herself that Callisto isn’t going to be happy, as she heads into the subway station. Spider-Man follows her there, people still think he is harassing her. A hand grabs her and Spider-Man doesn’t know what happened. Turns out the Morlock, Sunder, grabbed her. She is also the Morlock, Dreamer. She casts a spell to make him think he is handsome and she runs off. Next, we see Kitty Pryde in a modified version of her X-Men trainee uniform. She is in the Danger Room, doing great, as Xavier, Storm and Wolverine watch. Once the session is over, Xavier tells Kitty that it is bad enough that he is constantly putting her life in danger, he doesn’t want to deprive her of a proper childhood. He has volunteered her babysitting services to the Michaels’ family. If this is a friend of Xavier’s or an ad from Craigslist that Xavier found, who knows? This family hasn’t been heard from since. The Morlock Tunnels. Callisto is walking around as Spider-Man crawls about. She tells Ape and another Morlock to find Dreamer. She instructs Sunder to take Leech and find Spider-Man. Which they do! Leech turns off Spider-Man’s powers and Sunder knocks him out. I thought Leech’s power only worked on fellow mutants? Kitty is babysitting the Michaels’ children. They watch a scary movie involving mutants, but more like the monster type than the human type. Kitty tells them to go to bed. She reads them a story, but they are still afraid of mutants. Kitty has to break it down for them that mutants are just people with extraordinary powers. While reading to them, Dreamer comes crawling out of the ground – right outside the Michaels home. Of course. The Morlocks that are chasing Dreamer, see Kitty and the children. Kitty can’t expose her secret so she lets them be taken. Once she has a plan, she will risk anything to keep the children safe. Sometime later, in the sewers.Dreamer shows that she can make cartoon monkeys. Spider-Man is getting his powers back. Dreamer and Kitty are going to help with the escape plan, as they both announce they are mutants. The Michaels children are surprised, as they thought mutants were scary looking. Shortly. Kitty unlocks the door and Spider-Man takes it off its hinges – which alerts the rest of the Morlocks. why she didn’t just walk them all outside, is beyond me. Dreamer and the kids just motor off. Leech arrives and shows Spider-Man and Kitty are shut down. Dreamer and the kids come back, and the kids reveal they don’t find mutants scary anymore. Issue ends with Calisto’s heart going three sizes bigger and everyone gets to go home.